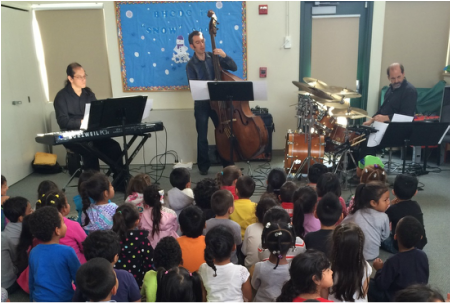 Guide for Teachers - Charged Particles: Jazz with a Spark! Plugged-In Jazz with a Spark! The most exciting and creative music being made today crosses stylistic boundaries and blends multiple traditions to create vital new sounds. Charged Particles features three of the country's virtuosos doing just that for contemporary electric jazz. Murray Low is a keyboard wizard whose classically trained technique and imaginative improvisational skills boggle the mind. Aaron Germain is an inventive and sophisticated acoustic and electric bassist. Along with fiery drummer Jon Krosnick, these players are making some of the most electrifying jazz in the country today. The trio's repertoire is jazz influenced by many other musical styles, including Latin music, funk, pop, and even classical. They perform both original compositions and arrangements of tunes by their most-admired contemporary jazz artists on the national scene, as well as a wide array of traditional jazz standards. All of the music features mixtures of elaborate orchestration and opportunities for creative improvised solos. All of the trio's music has a distinctly acoustic sensibility, despite the fact that the members play both electric and acoustic instruments. The small size of the group allows for great sensitivity and spontaneity among the players, making each performance an enchanting improvisational exploration. The band's energy level is always high, even when they are cooking at a volume no louder than a whisper, or floating through the melody of a romantic ballad. Each piece they play brims with the fun the players have together and with the admiration they have for each other. Charged Particles are a treat to hear! In the early days of jazz, trios featured acoustic piano accompanied by bass and drums, and their music was often spartan and stately. But today's jazz involves dramatic chordal and rhythmic complexity, intricate arrangements, and explosive energy. In Charged Particles, keyboard synthesizers offer broad palettes of aural colors and textures, and share the spotlight with electric bass and drums. Their workshop traces this stylistic evolution in jazz, illustrating how band members play their instruments, compose original songs, and work together as a unit, both on and off the stage. 1. Have students listen to a fully-time jazz radio station for 30 minutes (via the Internet) and write brief descriptions of the songs they hear. 2. Have a discussion about students' current understanding of jazz, how they would distinguish jazz from other types of music, the different styles of jazz with which they may be familiar, and any jazz they may have heard performed live. 3. Discuss the ways in which many areas of life have changed in recent decades as the result of technological developments, especially computers. Discuss any ways in which the students are award of electrical technology in music. 1. Ask the students to recall and describe the various styles of jazz that the band demonstrated. 2. Ask the students to describe what they think has to be done to form a successful jazz group. 3. Ask the students what the most impressive aspects of Charged Particles' music were. 4. Review the different parts of a drum set and all the different sounds a drummer can get from a cymbal. 5. Have one group of students clap a steady rhythm and have a "soloist" clap an improvised solo. Much can be learned about contemporary jazz by consulting regularly-published major national magazines, such as Downbeat, JazzTimes, and Jazziz. The roots of today's contemporary jazz are described in Jazz-Rock Fusion: The People, The Music (Julie Coryell & Laura Friedman, 2000, Hal Leonard Publishing Corporation; ISBN: 0793599415). A wonderful example of a contemporary acoustic jazz trio is a video by the Chick Corea Akoustic Band available via YouTube under the title “Chick Corea Akoustic Band 'Rendezvous in NY’ HQ”. A terrific example of contemporary electric jazz is the video called "GRP Super Live in Concert" (available on YouTube under the title “GRP Super Live in Concert (Japan 1987 – Laserdisk)”. The entire series of PBS television programs on the history of jazz by Ken Burns is available via YouTube under the title “Jazz - Ken Burns”. Our program can be tailored to suit the level of the audience involved, as well as time constraints. The group members each introduce themselves, described how they first became interested in music, how their training evolved, and how the place of music in their lives today. They also demonstrate the range of sounds that can come from their instruments, explain how each is operated and maintained, and describe the technical challenges each poses. For young audiences, some participants are invited up on stage to try playing the instruments, and they receive a little tutoring. This section focuses on how Charged Particles was formed, how its name and stylistic directions were chosen, and how it evolved from a fledgling ensemble into an established professional organization. This discussion addresses the notion of teamwork and the challenges in evolving a collective vision for an artistic partnership. This section describes the many different settings in which Charged Particles currently performs, ranging from concert halls to outdoor jazz and arts festivals to jazz clubs. Each venue poses its own unique challenges and has its own unique rewards. The discussion touches on each of these and gives participants a sense of life on the road for a jazz trio. This discussion introduces participants to the many styles of traditional and contemporary jazz. The group demonstrates matched pairs or triplets of traditional and contemporary tunes for each style. For example, they play a traditional swing tune and a contemporary one (Autumn Leaves vs. Got a Match? ), a traditional bossa nova vs. a contemporary samba (The Girl from Ipanema vs. Latina Una), a traditional ballad and a contemporary one (Body and Soul vs. In Peace), a funk tune (Chromazone), and a mixture of these styles (Soko Ban). Each demonstration highlights the evolution of the style over decades. To demonstrate how the trio works together to establish a style, they focus on a particular contemporary funk tune, entitled "Mobius Trip", composed by keyboardist Murray Low. First, the drummer demonstrates his part alone and explains the components of his basic beat. Then, the bass player demonstrates his part alone, and the drummer joins in. Finally, the keyboardist demonstrates his part alone and explains how it fits in with the bass and drums. This section illustrates the many feelings and emotions that contemporary electric jazz expresses, by contrasting them with more traditional approaches. Many traditional jazz compositions are relatively short (only 12 to 24 bars long), and performances of them involve a standard structure (melody - solos - melody). Most of Charged Particles' material is much more compositionally complex and highly orchestrated. The band explains the compositional process by focusing on a tune written by bassist Aaron Germain. Aaron explains how he conceived of the tune, what his models were, and how each part of the composition fits with the others. Every Charged Particles composition involves improvisation, which is the unique component of jazz in the context of instrumental music. In this section, band members explain the basic notion of improvisation and demonstrate how it is done. The demonstration begins very simply, with an improvised solo based on only one note. Then, increasingly complex solos are demonstrated, involving, 2, then 3, and then 4 notes. Then dynamic variation is added to the solo to demonstrate its role. When appropriate, participants are invited to the stage to improvise with the band. The program ends with a performance by Charged Particles of one of its more complex and challenging compositions, Criss Cross. The participants are briefed in advance about the structure of the composition, and they are given a hand-out to follow along as it progresses during the performance. All the elements of the previous discussion are nicely illustrated in this closing piece.